VH1's Hip Hop Honors airs this Monday and to commemorate this event, Zune is handing out these custom media players to the artists participating in the festivities. HipHopDX has some insight about these with their exclusive interview with Bun B. Click here to check out the article. These limited Zune's won't go on sale to the public, but hey, if there's an extra one just layin around, feel free to send one my way. I could use another 80GB. To celebrate the 2008 VH1 Hip Hop Honors show, which airs on Monday, October 6 at 10 pm ET, Zune created a customized black 80GB digital media player that will be given exclusively to the influential artists participating in this year's show. 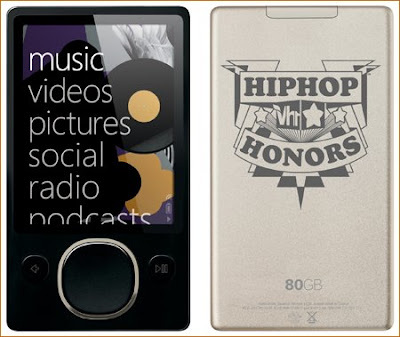 The custom Zune features Hip Hop Honors artwork and will be limited to a run of 80 units. The specially created player will not be available for sale to the public but Hip Hop fans can get a look at what their favorite artists will be rocking.